Below are a few things to consider when using the Strong Start Index map and data. To learn more about the methodology and construction of the index, please see our FAQs page. Data are displayed by Census tract to show how conditions for babies vary by location. Data for the Strong Start Index are displayed essentially by neighborhood. 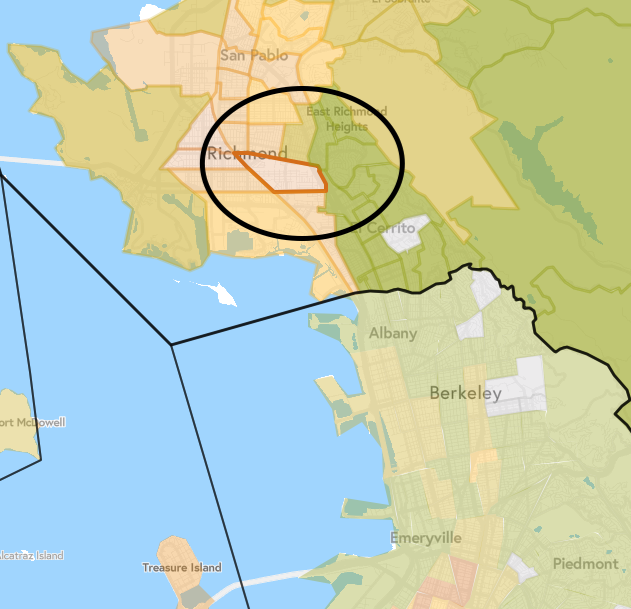 Our proxy for a neighborhood is a Census tract, which is a federal designation used to organize data at a more granular level than a city or county. 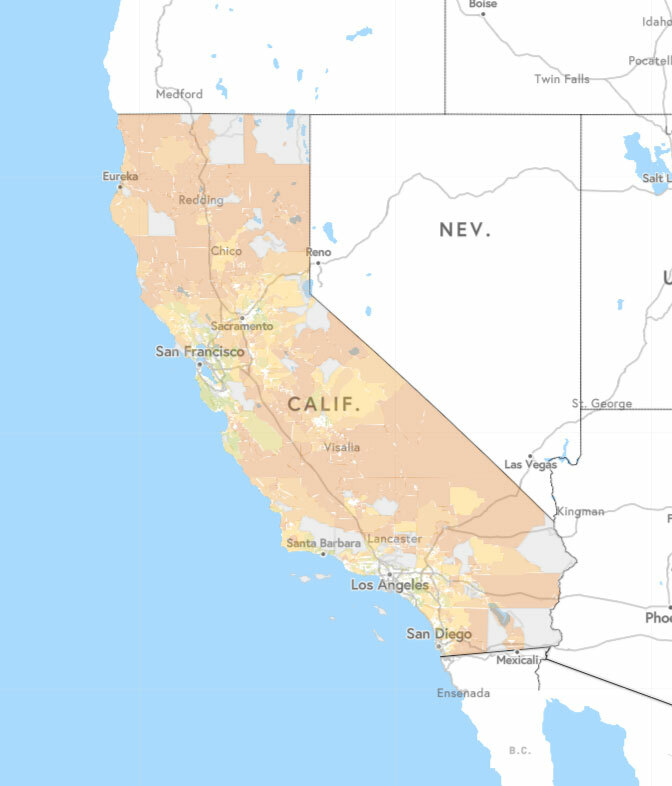 All Census tracts across the United States have roughly the same population, between 2,500 and 8,000 people, but their geographic size can vary considerably. 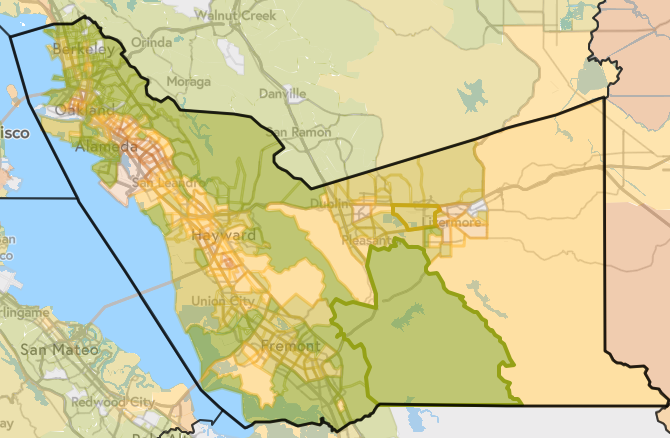 Consider this representation, below, of two Census tracts in Southern California. While the two Census tracts have about the same population, they are vastly different in how much land they comprise. Census tract 103 in San Bernardino County, outlined in dark orange on the map below, represents roughly 4 percent of California’s land mass…but contains just 0.01 percent of the state’s population. A key reason the Index organizes data by Census tract is so decision makers can direct resources where they are needed most. Imagine you run a foundation or nonprofit serving children in Fresno County, where 15,000 babies are born each year. It would be useful to know that in one neighborhood, babies score in the highest 20 percent of Strong Start Index scores in the state, while in another neighborhood, mere streets away, babies score in the lowest 20 percent of scores in the state. This information could help you make decisions about where and how to invest and deliver services. Getting a statewide picture requires diving into details. An initial glance at the statewide map shows a lot of rose color, which indicates a lower score on the Strong Start Index. Many of the rose-colored areas are sparsely populated compared to the rest of the state, however. 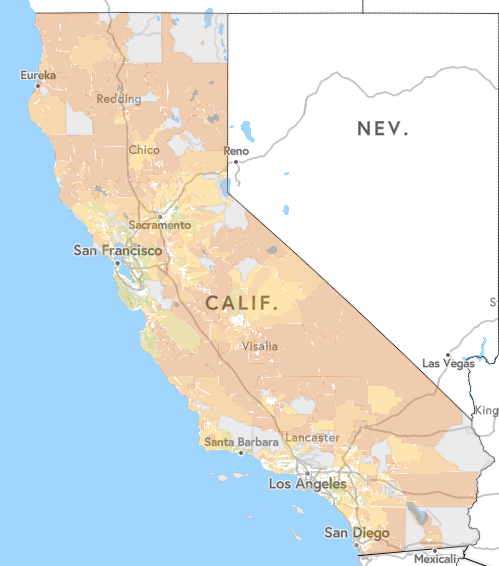 So we can’t draw conclusions about how babies in California are doing overall by looking at how much space each color occupies on the statewide map. On average in California, babies are born with nine of the 12 Strong Start assets that can help them thrive. But Census tracts with the most assets have an average of 11, while those with the least have an average of just six assets. For the best county picture, zoom in. Within counties and cities, differences become clearer. 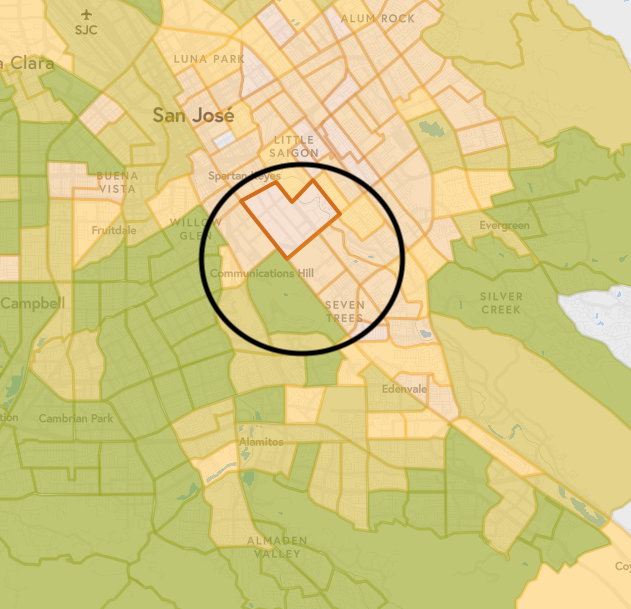 In south-central Alameda County, we see a lot of green, or highest scores, in a Census tract that is sparsely populated (left image). 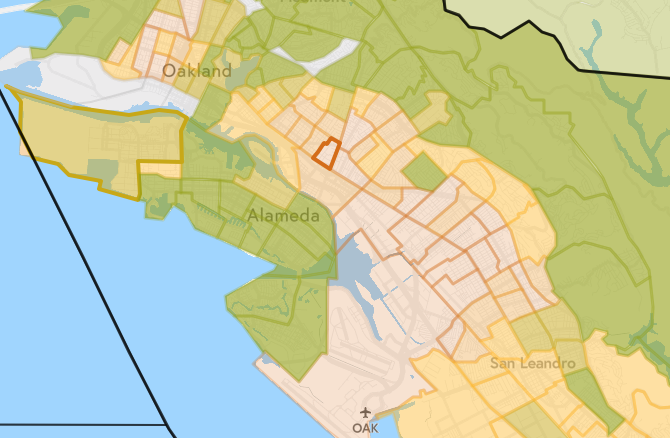 But, if we zoom in to see the densely populated neighborhoods of Oakland, we see babies are born with some of the lowest scores in California, on average (right image). 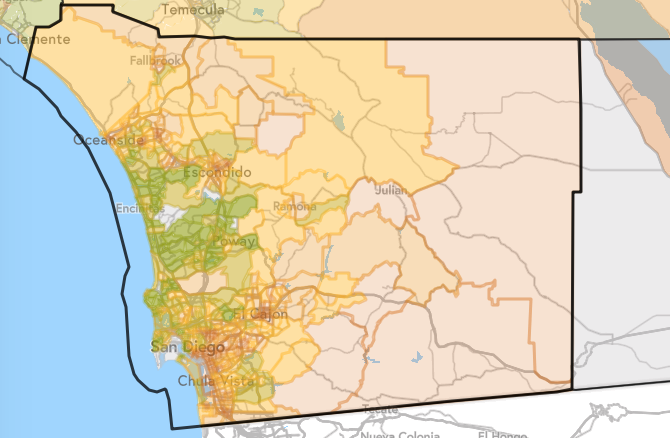 In fact, many counties have a similar patchwork of colors, such as San Diego and Sacramento Counties, below. 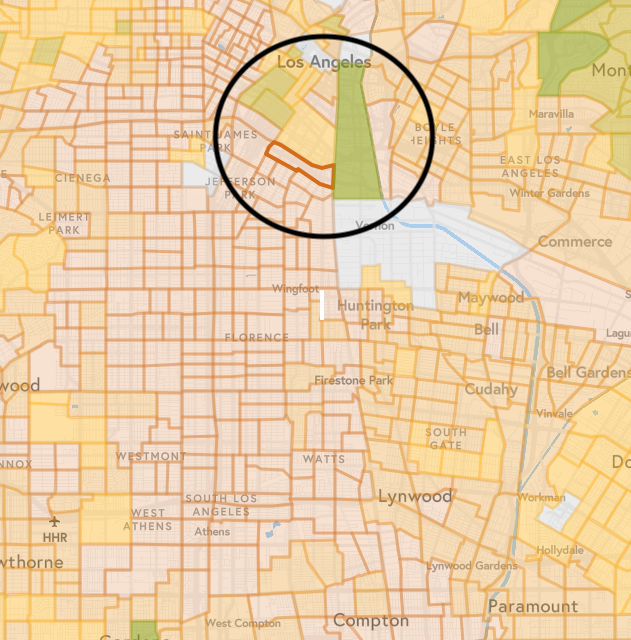 It’s not uncommon to see densely populated areas, like Los Angeles, have neighborhoods with the highest Strong Start scores in the state next to neighborhoods with the lowest scores. We see this in adjoining neighborhoods in San Jose and Richmond, too. Curious about your own area? To learn more about how you can use the Strong Start Index to advocate for children and families, visit our Get Involved page.